It’s that time of year again. 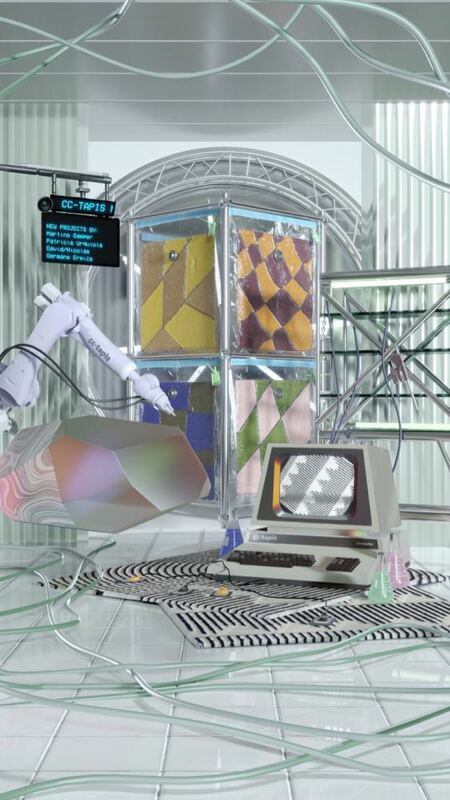 Everyone’s phones and computers are about to be inundated with images from the Milan Furniture Fair. Not wanting to be left out, Design daily has once again put together a selection of interesting new items form the world’s most important design fair. The official Salone del Mobile starts on Tuesday April 9th but things are already hotting up in the city itself, with previews starting on Saturday. These events scattered around the inner city areas like Brera, 5Vie, Isola and Tortona are collectively known as Fuorisalone. Here is where you will find artful installations in glamorous palazzo venues, fashion stores, car garages or in grungy former factories. The beauty of Fuorisalone over the fairgrounds at Rho, is the ability to duck in and out with small amounts of sightseeing and eating and drinking possible in between events. Design daily will be ramping up its instagram output for the duration of Milan Design Week (8-14 April) while the blog will deliver two seperate posts after the fair has ended - one featuring the most exciting installations found across the city - and another collating the best of all the new releases launched this year. Stay tuned! Brodie Neill’s Made in Ratio will be showing a new screen / room divider called ‘Theorem’ along with extensions to their successful ‘Alpha’ chair in the form of a barstool in two heights. Both stools exhibit the same sinuous form as the chair. It would be remiss of Design daily not to point out that Australian designers will be arriving in Milan en masse. Local Design alone is bringing the work of 44 Australian designers! 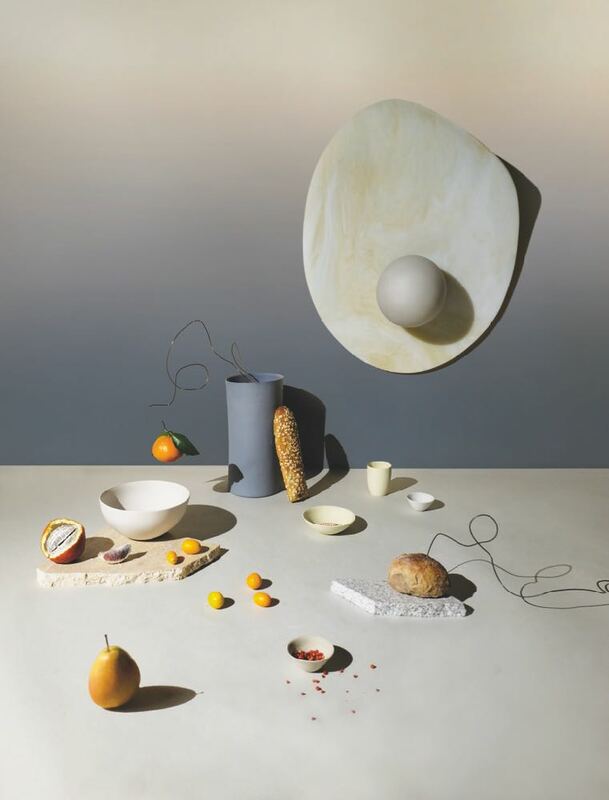 In addition to this ENORMOUS showcase, ceramics studio Mud Australia will be showing with New York design duo Ladies & Gentlemen at an installation called Still Life in collaboration with New York’s Calico Wallpaper. Mud Australia and New York’s Ladies & Gentlemen are collaborating with Calico Wallpaper on an installation called Still Life. Sydney design studio and manufacturer, Design by Them have taken a large space in Isola, to the north of the famous Brera district, where they will be showing 35 of their pieces in a 250 square metre space. This in Milan terms is bigger than Ben-Hur. 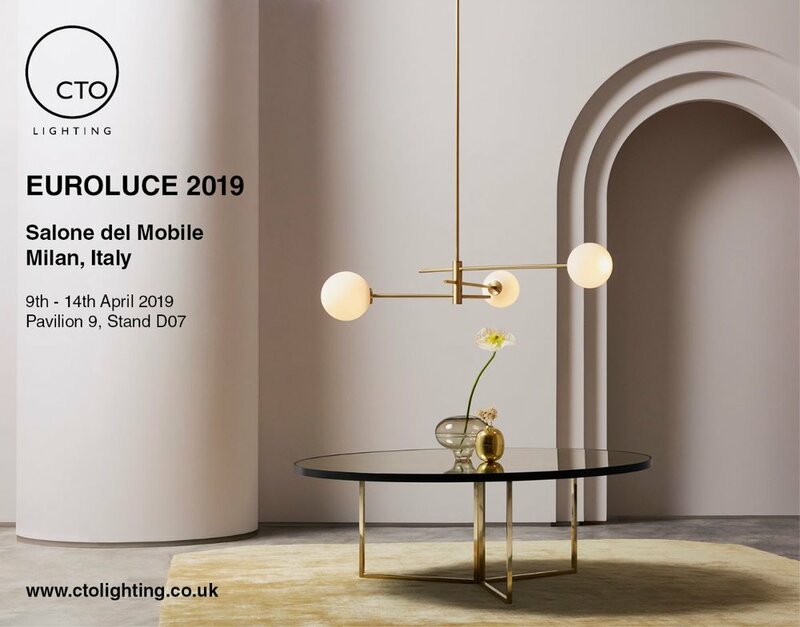 In addition to this Melbourne lighting studio Volker Haug will show in a seperate location to Local Design in the 5Vie design district while Melbourne based lighting companies Rakumba and Articolo will be showing at Euroluce at Salone del Mobile (the main fair grounds in the suburb of Rho). Brisbane based designer Jason Bird will be presenting his sound absorbing ‘Zig Zag’ light for Italian lighting company Panzeri. Euroluce only happens every second year and it is always an exciting display of the best new lighting from around the world. 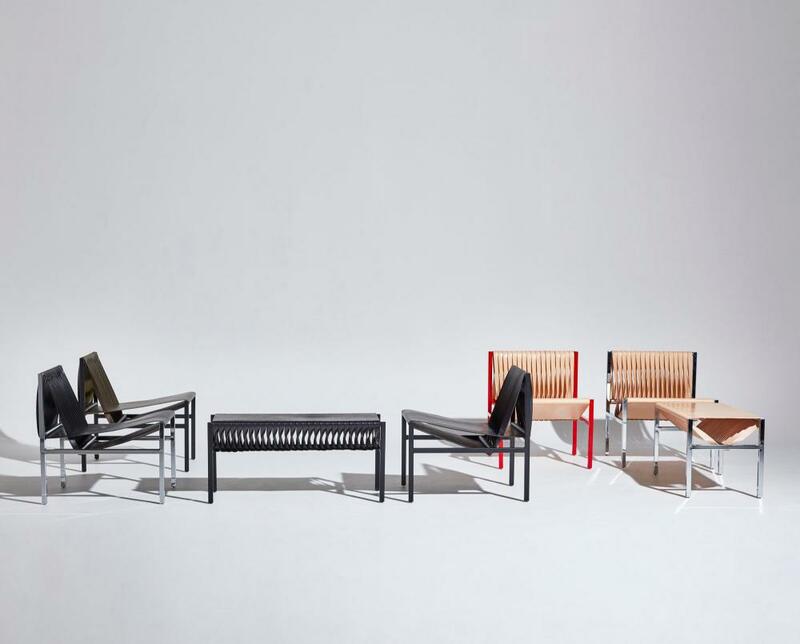 Sydney’s Design by Them has collaborated with Australian fashion designer Dion Lee in a small collection of chairs and benches in a variety of finishes featuring sliced saddle leather. Showing a completely different side of Australian design is Trent Jansen. His anthropological approach is always fascinating and this year he is presenting a new collection called Shaker Family Home. The cherrywood cabinet opens up to reveal drawers that turn into a table, drawers that become mirrors or candleholders - there is even a hidden blanket chest. ‘Shaker Family Home’ cabinet by Australian designer Trent Jansen. Photograph by Romello Pereira. 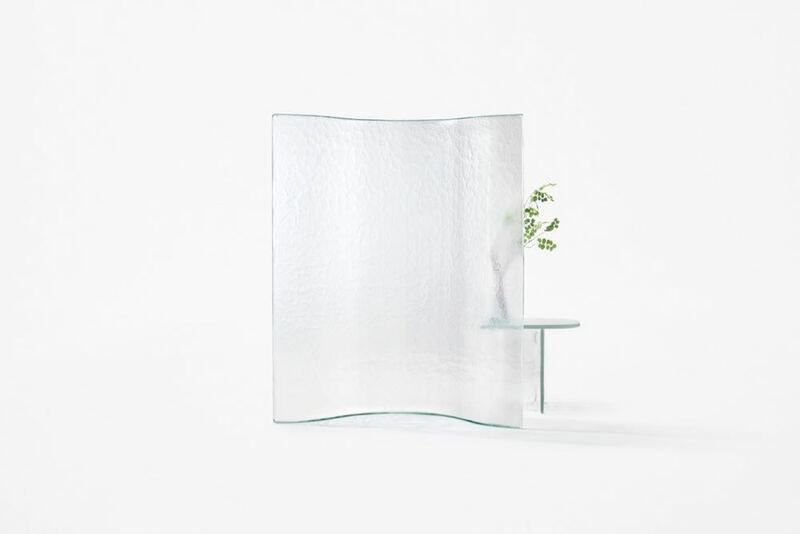 Getting back to international design - and you can’t get much bigger than Nendo - Oki Sato the principle of Nendo presents his ‘Melt‘ collection for WonderGlass The collection is a fluid expression of the potential of solid glass forms created in the glass workshops of Venice. While the chair was revealed during imm Cologne, the complete range including vases, side tables and benches will be launched during Milan Design Week by WonderGlass. The collection is made of slabs of molten glass that undergo the carefully controlled effects of gravity to create the flowing forms. The full ‘Melt’ furniture collection by Nendo for WonderGlass. The two images below show the wondrous new lighting concept ‘WireLIne’ by Formafantasma for Flos. The light uses a specially developed conducting rubber to allow the light to work without additional wires. New York’s Calico Wallpaper teams up with British designer Faye Toogood for a new wallpaper called ‘Muse’ where the female form is the focus. The design came about after last years’ Vogue Italia event Life in Vogue during Milan Design Week. Toogood created the design as part of a one-off installation in the magazine’s offices. With the sheer number of items previewed it means that Design daily has had to reel in the indulgence and cut to the chase a little more rapidly than in previous years. The rug displayed on the left is from Atelier Février while shown on the right is a new pendant fitting from the ‘Mezzo’ family by British lighting brand CTO. With large-scale ceramic panels becoming increasingly popular with architects and designers, Italian porcelain brand Florim have relaunched the historical ceramic brand CEDIT (Ceramic Italia) that was once the leader in design-led ceramics with iconic 20th century designers such as Marco Zanuso, Ettore Sottsass, Enzo Mari and Alessandro Mendini, (among a massive list) working with the brand. The goal is to embrace the brilliance of these early collaborations but also to offer the same freedom of expression to current designers allowing them to develop new ideas that were previously impossible - due to new technological advances. Recent collaborators have included Formafantasma, Zanelatto Bortotto and Zaven. 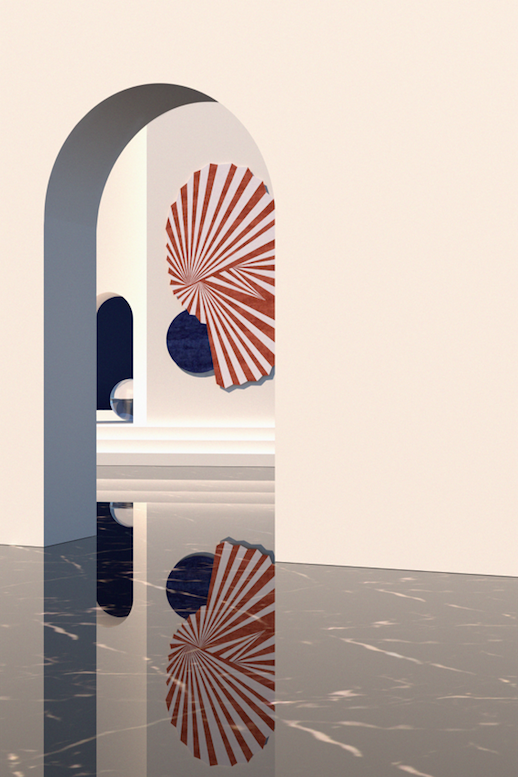 This year Cristina Celestino and Federico Pepe are presenting new concepts in porcelain panels (see below). Cristina Celestino’s ‘Policroma’ for CEDIT (Ceramiche d'Italia) references classical shapes in muted tones and monochrome. Federico Pepe’s ‘Araldica’ for CEDIT (Ceramiche d'Italia) - eye popping colour and hypnotic graphic pattern - all on a panel. 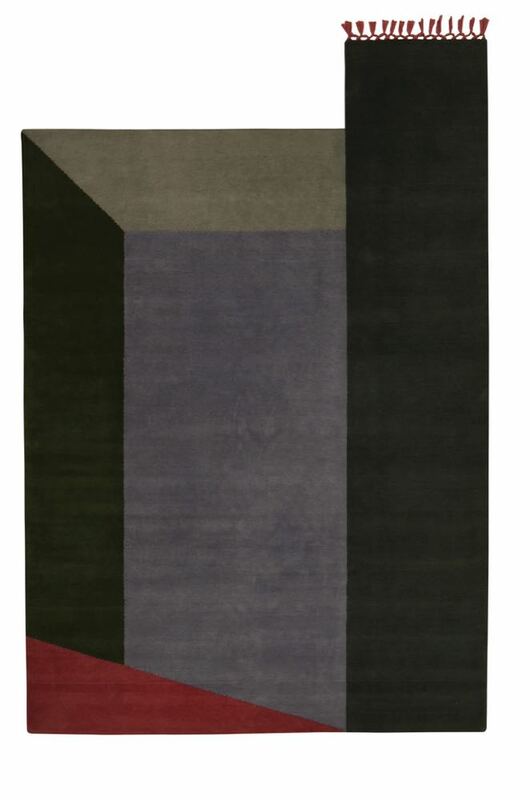 It’s no secret that Design daily is a fan of Milan based rug company, cc-tapis. They have injected copious amounts of fun, colour and character into the contemporary rug scene in recent years. This year regular collaborator Patricia Urquiola presents ‘Fordite’ a geologically inspired rug, while Martino Gamper delves into cartoon-like graphics to create an extensive collection of rugs called ‘Xequer’ that play with chequerboards, colour and perspective. Beirut based designers David/Nicolas are designing their first collection for cc-tapis this year. If their other work is anything to go by ‘Plasterworks’ should be a knock out. 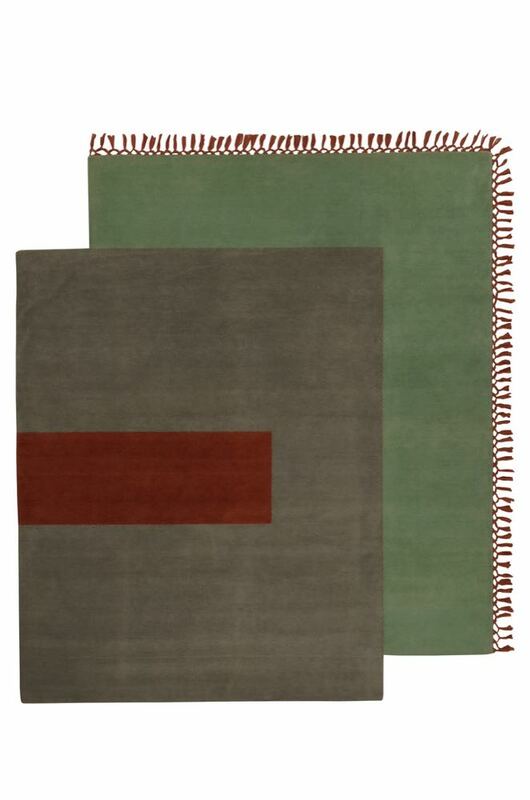 Shown below is the cc-tapis invitation image along with one of the five Martino Gamper ‘Xequer’ rugs. 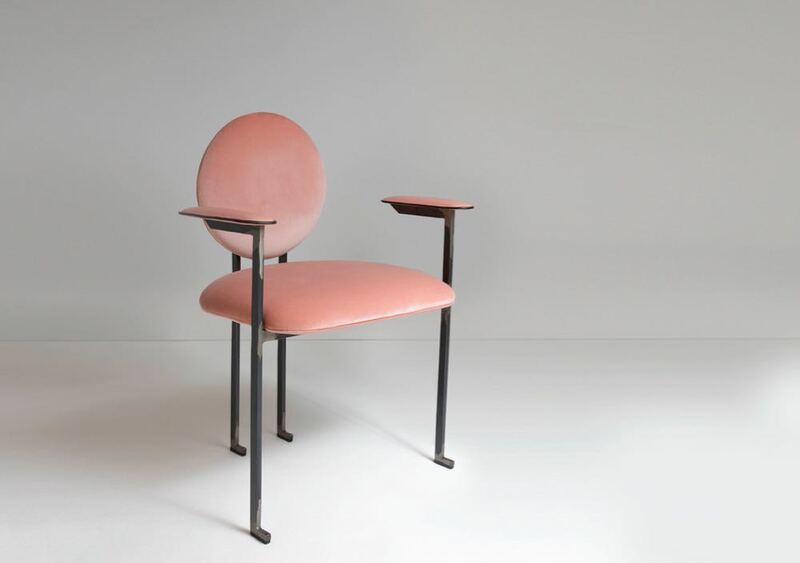 New York-based product designer Mario Milana presents a new version of his iconic MM3 in blush coloured velvet. The contrast of hard bent metal and soft upholstery is extremely appealing. Shown below are just two of a collection of six exciting geometric rugs called ‘Terrazze’ in gorgeous sophisticated colours by Elena Caponi Studio for Mohebban. ‘Terrazza Portello is shown on the left, while ‘Terrazza Isola’ is on the right. For the rest of these beautiful designs go to Mohebban website linked above. Metal specialist Mingardo are showing in Brera once again with new designs by Bernhardt & Vella, Finnish designer Elisa Honkanen, Valerio Sommelia, Studiopepe and Gio Tirotto. Mingardo was founded in 1970 and worked on numerous projects for architect Carlo Scarpa. Under Daniele Mingardo, the son of the founder, Mingardo has modernised and brought in design talent to create their own collections as well as continuing produce custom work to commission. The new Mingardo collection Diorama with pieces by Bernhardt & Vella, Elisa Honkanen, Valerio Sommelia, Studiopepe and Gio Tirotto. Art direction by Federica Biasi. Federica Biasi also designed a new shelving system called ‘Marianne’ (shown below) made from brass, glass and steel. Like Albini’s classic ’Infinito’ bookcase and Michael Anastassiades’ recent ‘Jack’ shelving for B&B Italia ‘Marianne’ is height adjustable to ‘clamp’ the shelving between the floor and ceiling. 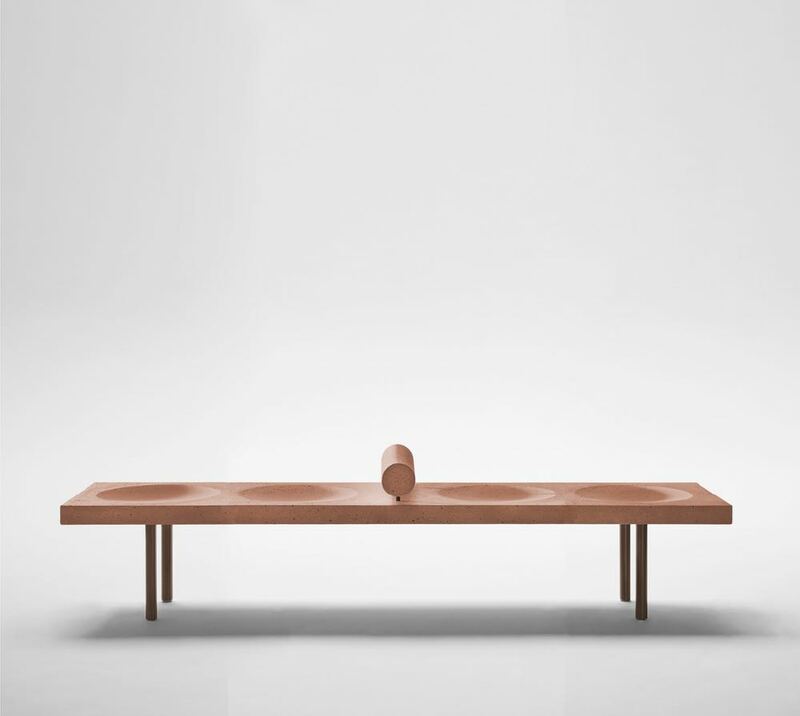 ‘Domino Concreto Bench’ by Claudia Moreira Salles for leading Brazilian design gallery, ESPASSO. 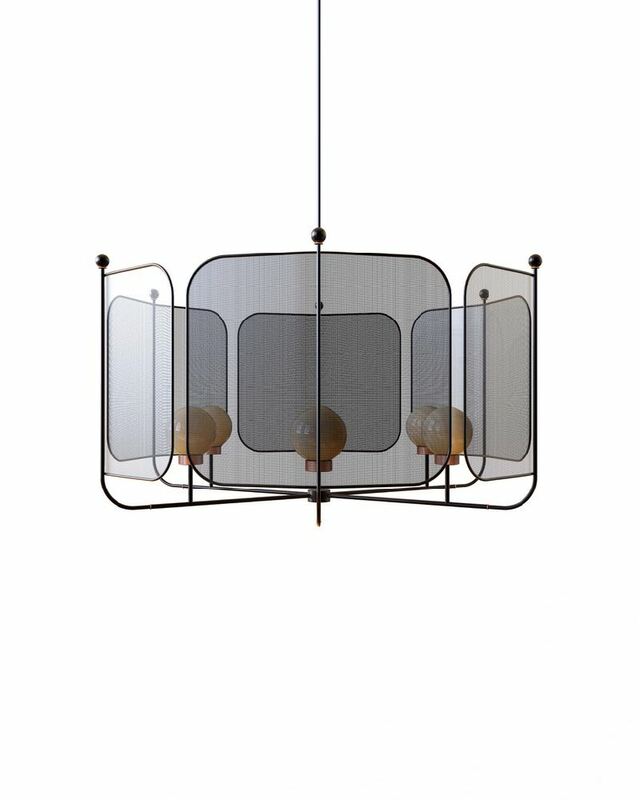 Frederica Biasi, the art director of Mingardo is also presenting a new pendant light design called ‘Jolie’ for Gallotti & Radice (shown below). The beautiful glass and brass design plays with the distortions that come from the use of thick solid glass. 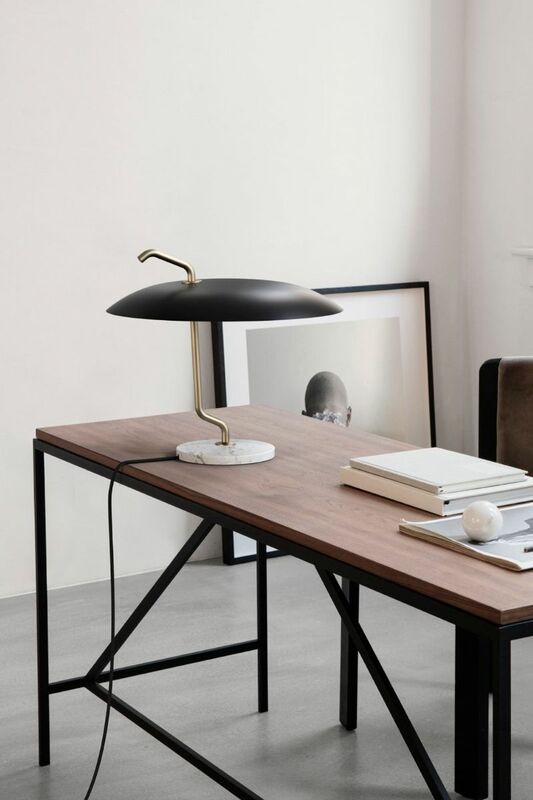 Recently established Danish lighting company Astep is the result of years of work by Alessandro Sarfatti - the grandson of famous Italian lighting designer Gino Sarfatti. The brand has released a swathe of Gino Sarfatti designs from the 50 and 60’s over the last few years but also developed some extremely interesting contemporary designs. 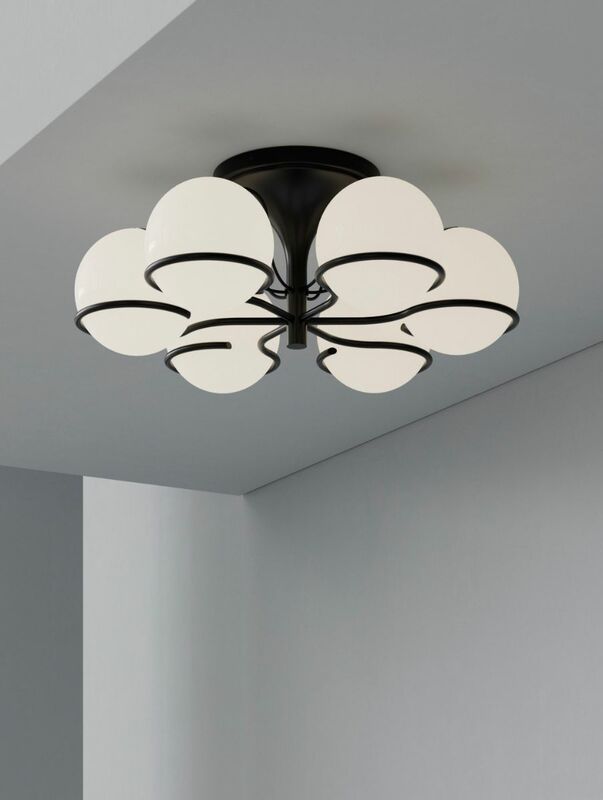 They have gone from strength to strength since launching just a few years ago and now collaborate with leading Italian lighting company Flos on the Sarfatti collection. This year sees them reissuing the Sarfatti designed ‘La Sfere Plafone’ chandelier (Model 2042/6) from 1963 (below left) and the beautifully whimsical ‘Balancing Light’ (Model 537) table lamp shown below right. There couldn’t be a preview of Milan Design Week without mention of Dimore Studio, one of the most high profile design studios in Milan. Their style is unpredictable, always adventurous and sometimes courageous. 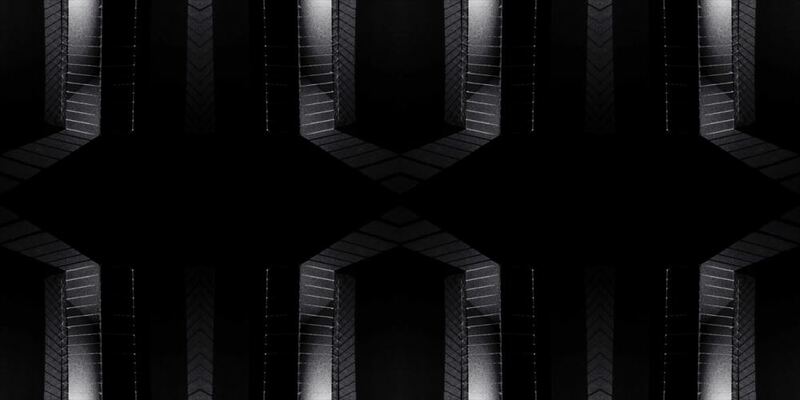 There installations blend aspects of a happening, a music event and theatre. This year they are delving into fashion as much as product and spatial design with a capsule collection for Dior and a new fabric collection presented at several venues around the city. DimoreGallery, an extension of the studio in Via Solferino has a vast interest in design heritage and always shows spectacular vintage pieces along side the studios contemporary works. This year founders Emiliano Salci and Brit Moran are showcasing the wildly artistic work of celebrated designer and artist Gabriella Crespi in an exhibition called Visioni. Dimore Studio are presenting all manner of things this year from an exhibition of new material interpretations on classic Gabriella Crespi pieces called Visioni, to a capsule collection for DIOR, with several other fabric and furniture collections in between……..
Dimore Studio present………..INTERSTELLAR - a new furniture collection on show at a Cinema Arti - a former Facist cinema in the heart of Milan. Gabriel Abraham, a former set designer, imagines seating and lighting inspired by Robert Altman's The Long Goodbye for Atelier de Troupe. 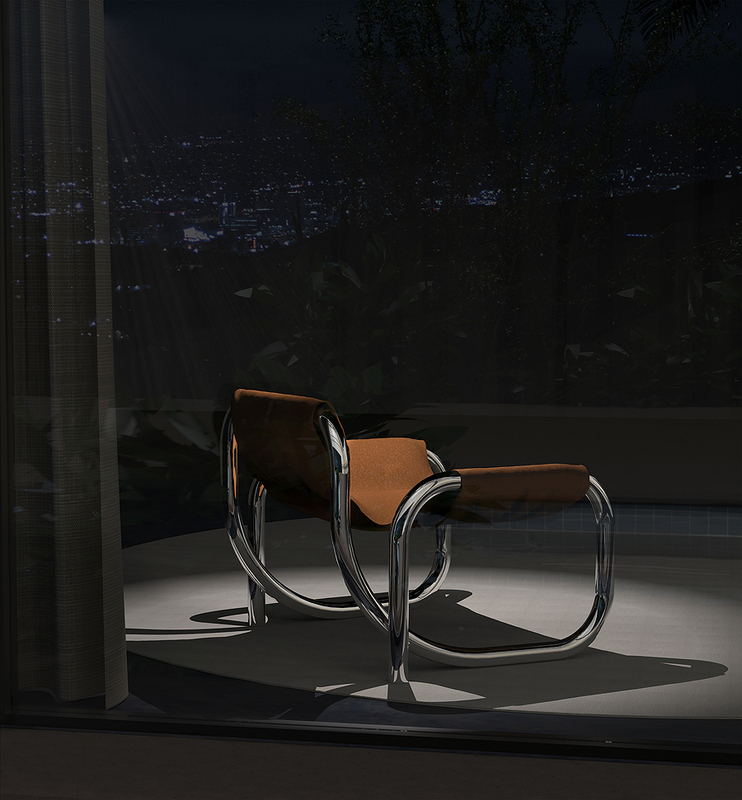 LA NOIR presents lots of chromed steel and leather in extraordinary shapes. The Italian brand Pianca from Gaiarine (near Venice) present ‘Platea’ by Emilio Nanni, - a generous modern take on the classic wing chair. If the two sofas shown below are anything to go by, 2019 is looking like a year of plump to-the-floor sofas. The Diesel / Moroso ‘Aerozepplin’ sofa. Danish designer Johannes Torpe’s ‘Heartbreaker’ sofa for Moroso. The design was created during Torpe’s own relationship turmoil. The heart shaped back cushion is the key feature of this seamlessly upholstered piece. The two objects shown below are renders of new products by Quincoces-Drago (David Lopez Quincoces and Fanny Bauer Grung) being presented during design week by ceramic specialist Bitossi. The vase forms are influenced by the strength of historical shapes from the Bitossi archives. The treatment of fluted ceramic and turned wood is however pure Quincoces-Drago. Italian architect and design studio Storage Milano seem to be doing a huge amount this year with products for Karpeta, Masiero and the Life in Vogue installation to name just a few. Below can be seen two of four new rug designs for Karpeta. One of the new irregular shaped rugs by Storage Milano for Karpeta. One of four new rug designs by Storage Milano for Karpeta. This is just a small selection of the avalanche of new work that has been flowing into the Design daily inbox over the last three or four weeks. Please follow us on instagram @designdaily for on the spot reports on all the exciting new designs and installations from the 8th of April and get ready for some comprehensive posts after the fair!